Jumolhari Trek is one of the best and finest treks. Jumolhari Trek gives excellent opportunity to view great Himalayan summits like Mt.Jumolhari, Mt.Tsheringgang, Mt.Jichu Drake, etc. 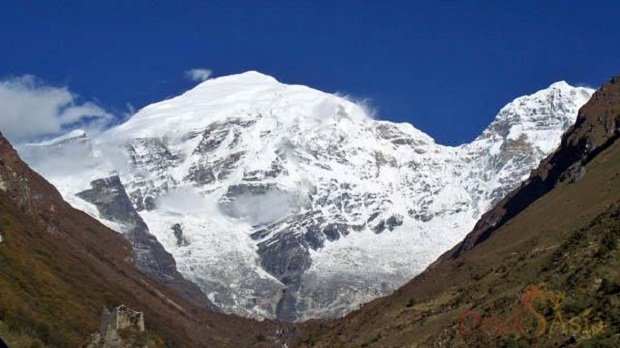 It is also possible to view Mount Jumolhari from a close range at the base campsite Jangothang. The trek best suits from April to June and September to November. Days are warm but cold at night especially beyond Jangothang. Starting point of trek is from the ruined fortress of Drukgyel Dzong at Paro. Arrival at Paro International Airport and you will be received by our representative from TLF Holidays. After lunch drive to the ruins of Drukgyel Dzong, 16 km up the valley built in 1647 by Shabdrung Ngawang Namgyal. The Dzong was destroyed by accidental fire and left in ruins as an evocative reminder of the great victories it was built to commemorate. Explore the ramparts and on a clear day experience an unforgettable view of Mt. Jumolhari (7,314 Mtrs.). Later visit Taa Dzong, formerly a watch tower but now houses the National Museum. Taa Dzong holds unique and varied collections, ranging from ancient armor to textiles, Thangkha paintings, stamps, coins and natural history. Walk down the hillside terrain to visit Rimpong Dzong, built in 1646 during the time of Shabdrung Ngawang Namgyal. It now houses Paro’s monk body and offices of the civil administration. Rimpong Dzong is the venue for the famous Paro Tsechu festival, held annually in the spring. First day of the trek follows Paro Chu valley climbing up the ridges. The actual trek starts from Drukgyel Dzong, which is at an altitude of 2580 Meters. After covering short distance you will find settlement of Chang Zampa; a further walk takes to settlement of Mitshi Zampa with small shops and local hotels. The valley widens and you will reach an army post at Gunyitsawa, which is at an altitude of 2810 Meters. You will also find a primary school and small shops. Distance is 17 kms; and takes approximately 6 hours to reach the campsite, which is beyond the army post. The trek continuous along the side of Pa Chu (Paro River) through thick conifers and rhododendron forest which also falls under the demarcation of Jigme Dorji Wangchuk National Park. With a gentle climb on the rock through oak forests, crossing steams you will see Phari Dzong of Tibet. Further climbing the ridge, cross the Paro Chu on a wooden bridge, you will reach Soi-Thangthangka at an altitude of 3630 meters. Distance is 22 kms, and takes not less than 7 hours to reach the campsite. You will start to have closer view of Mount Jumolhari from the campsite, you should specifically try to view early in the morning. Your today’s journey begins with a short and gentle climb across an army post and Takethang, a thinly populated village with stone made houses on a plateau at an altitude of 3940 Meters. Distance is 19 kms, and takes approximately 5-6 hours. Campsite at the base of Mt. Jumolhari. Day halt in the base camp for acclimatization. You can either make a day hike to Tsho Phu Lake, which is located at a slightly higher altitude, or go towards the base of the mountain? Both ways, you will get spectacular view of the snow-capped mountain range.The ridge is endless, after an hour of climb you can view Mount Jichu drake (6989 m) and Mount Jumolhari. Get up early for golden view of Mount Jumolhari, which looks like a heap of gold in the early sunlight rays. Also, very important that you should check your fitness today to proceed ahead towards Lingshi. You should be careful and should not proceed ahead if you are feeling altitude sickness. Trekking further you will go through Nyele La pass at an altitude of 4890 Meters. You will descend down to an altitude of 4450 Meters and stop for lunch. Trekking further, you will come across army camp and reach Lingshi. Distance is 18 kms, and takes approximately 5-6 hours. The Laya-Gasa route leaves Jumolhari and climb opposite the camp towards Lingshi Dzong through a white Chorten. It climbs steeply to Yale La Pass at an altitude of 4820 Meters. From this pass on a clear day, you will have beautiful view of Mount Jumolhari, Mt. Gangchhenta, Mt. Tserim Gang and Mt. Masang Gang. Trekking further downstream, come across Shodu at an altitude of 4110 m. Distance is 22 kms, takes approximately 8-9 hours. The trail today crosses the same river six times on a bridge built of huge logs. Within a short climb and a normal walk, you will reach Barshong. Barshong has a small ruin Dzong. Camp is below the ruin Dzong at an altitude of 3680 Meters. Distance is 16 kms, and takes approximately 5-6 hours. The trek continue over dense forest of rhododendron, birch and conifers and drop to Thimphu Chu (Thimphu River) to reach Dolam Kencho at an altitude of 3430 Meters. Distance is 15 kms, and takes approximately 5-6 hours. The trail goes in and out through conifers and high broadleaf species to a pass at an altitude of 3510 Meters. The trail drop down and reach to road head at Dodina at an altitude of 2600 Meters. You will be received by our representative and drive to Thimphu. Following early breakfast, sightseeing of Thimphu – visit Memorial Chorten, Changangkha Monastery, Zilukha Nunnery, National Library, Folk Heritage Museum, Zorig Chosum (Painting School), Post & Telegraph office to view Bhutanese stamps, Takkin (national animal) Preservation center, Sangyegang view point, Buddha’s Point, Handicrafts Emporium, Bhutanese Handmade Paper factory and Tashichhodzong (the central secretariat building).